Vallejo: Night Blue, Black ad White. Judge the mix by your eye. That is how I do it. Visit the shop to find our new DEAL OF THE MONTH which will obviously change monthly! 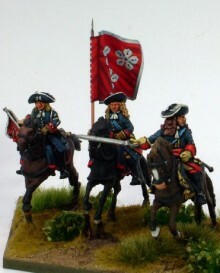 We have had many requests to sell cavalry in regiments so for the month of April we are doing so. Not only will you get 18 models(6 packs of your choice) you'll get a free flagsheet and lance poles with finials and cords. You can now buy our very popular FIELD GUN with an ornate FRENCH BARREL. We have brought out a line of high quality POLO SHIRTS with the Beneath the Lily Banners logo embroidered. Shortly the League of Augsburg shirts and fleeces will also be available. REPUBLIC TO EMPIRE has a new RRP at £20.00 so if you don't yet have a copy pick one up!